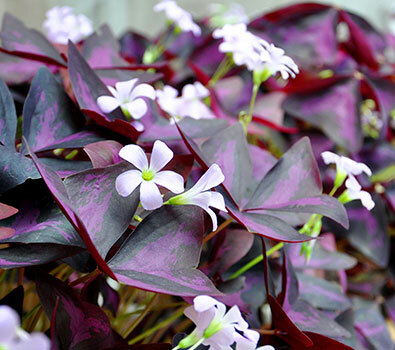 The Purple Shamrock is the most common species grown as a houseplant is Oxalis triangularis which has three common names, False Shamrock, Purple Shamrock and Love Plant. It has three purple heart shaped leaves, which each have three sides, that sit symmetrically to one another at the end of every petiole (or “stem”). Purple Shamrock house plantOther species are similar in shape, except they tend to have green leaves. The plant is also a little bit magic, because it can revive itself from the dead! Rather than being intrinsically linked with the soil like many other plants, Oxalis is linked to the soil by its tiny bulbs. Forget to water it, temperature drops too low or its living conditions are generally poor, everything above the surface will wilt and die back to take refuge in the bulbs below. As soon as good conditions are restored the plant comes back to life incredibly quickly. This is great for those little accidents where we forget to water our plants for several months at a time, not so good for those who live in temperate regions of the world where this plant can be viewed as a weed.